Now that I have enticed you with the above picture, don’t you want to know how to grow it? I bought the seeds from Baker Creek Heirloom Seeds and waited with bated breath for the little seedling to develop into a plant. (Some I planted inside and others I sowed right into the soil.) From the very beginning, it has tinges of reddish/purple or perhaps deep magenta. As it grew through the season, it formed a plant that resembled a peacock with a beautiful plume on top. My friends would gasp when they saw it. Even its leaves tasted like an earthly spinach. The insect nibbled on it a little but nothing drastic. Drought and heat tolerant. A Garden girl’s dream! I found a plant that was worth its weight in gold. Some of the stalk grew to about five feet tall while others seem to top out at six feet tall. As they grew, the thick stalks needed support especially as Fall arrived with its gusty winds. A few weeks go by and no hard frost. (So I thought.) I called Catherine again and asked what to do since I did not believe my area had a hard frost yet. The only thing that died was my eggplants. My squashes were still producing. She replied that they had a hard frost in Missouri. And then I realize it. I probably missed it. She then proceeded to explain how I had to thrash the plants to remove the seed and then blow away the chafe. Thresh the seeds? What have I gotten myself into? Did I create a mess? You betcha. 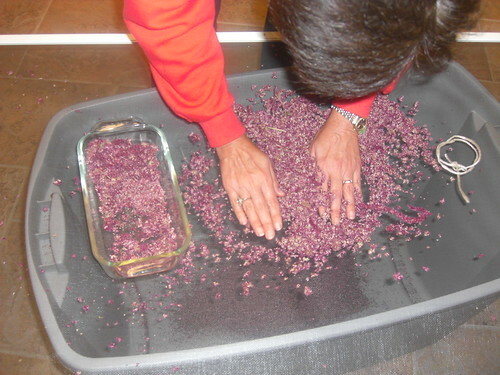 The seeds and flowers went all over the room. So, I was sweeping them up and then dumping them through the screen. I kept the flowers that fell off and put them in the above bowl. I have no idea what I am going to do with them. Another friend suggested scenting them with an essential oil and use them as potpourri or putting them in glass bowls with other metallic balls for a holiday look. Martha, any ideas? As for the Amaranth that dried, Catherine told me that it would be difficult to extract the seeds once the flowers had dried. I tried rubbing the dried flowers between my hands and yielded some seeds. I fared better when I rubbed the flowers against the screen. With all this effort, I probably garnered about 3 cups of seeds for ten plants. What about the plume? They are still beautiful and are in a flower arrangement in my living room. I will see if they drop their blooms overs the winter. My best advice is don’t play with them too much, since they shed all over the place. Arrange them and admire them from afar. What will I do with my Amaranth? I probably will mill it with a grain attachment for my Kitchen Aid Mixer. Maybe make that chocolate cake I mentioned in my amaranth cooking article. (My mouth is already watering…) Who knows. Now that you have grown it, how do you cook with it? No fear. Check out my cooking Amaranth post here. As I noted above, I left the amaranth plants out in the field too long but was able to thresh the seeds heads. I will take her advice next year. That sounds like an ambitious project! The threshing, especially. I’m glad that you found some satisfaction in it, and I hope that you enjoy eating the finished product. .-= Amber´s last blog ..Who do I Think I am, Anyway? =-. 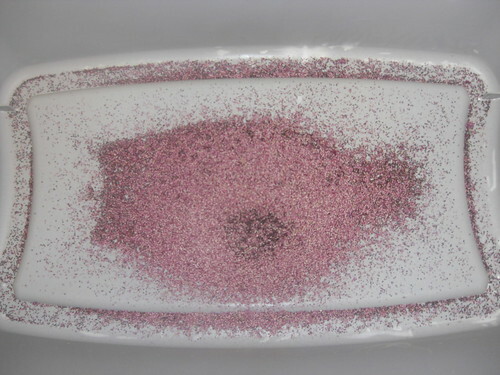 I was researching growing amaranth and came across your article. Thanks for sharing your experience. Amaranth is something I have not grown – yet. I bought a package of Amaranth seeds this summer and planted them in my flower garden with bated breath. Unfortunately, nothing came of the seeds. I discovered my neighbour (I live in a Duplex with a shared front yard) planted her own seeds and they all took over the entire garden. I still have some Amaranth seeds left over and I want to try growing them inside the house and transplanting them next summer outside. If I can get them to grow I would love to try threshing them. Great article! Thanks! Anna, I am a student at Mt. San Antonio College in the city of Walnut, California. I was given an assignment on amaranth and would like to know if you can give me any information or special interesting things you found during your process. I would appreciate your help and you will be credited for it 🙂 hope to hear from you soon! Thank you! Hi, I loved your article on both buckwheat and amaranth. it was the first time I have found a person who rattles on and is so in love with plants for food and health, as I am. thank you for your amazing website I live in Mozambique – it is hot and tropical and most things grow… so we have lots of fun living off our garden as much as we can. I have just ordered both Amaranth seeds and buckwheat – wish me luck. Jackie, I am very passionate about growing. It just amazes me of all the great food items to grow out there. I am glad I inspired you to grow both plants. Buckwheat likes it cool so maybe grow it when it is the coolest part of the season.